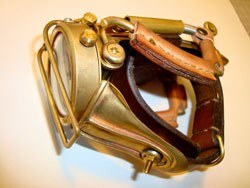 Steampunk's turn toward the past is more than merely aesthetic. Technology is viewed with a turn-of-the-century sense of wonder that opposes our contemporary tendency to take it for granted. And it is now more pervasive in pop culture than some may realize. Haruo Suekichi's handmade watches are anything but practical. With hand-carved faces that sometimes fold outward, intricate, counterintuitive leather straps riveted in brass and copper, and idiosyncratic styling -- as in the marriage of a miniature cannon with a watch-face resembling a compass -- the watches, while fully functional, are barely recognizable as such. They are odd, fanciful productions, at once enchantingly anachronistic and reminiscent of the torture devices of some futuristic world. Suekichi's watches are among the many objects that Art Donovan, an artist living in Southampton, New York, has collected for an exhibit at the Oxford Museum of the History of Science. Curating the exhibit sent Donovan on a bit of a treasure hunt. Suekichi, for one, lives and works in Tokyo, and has neither email nor personal website. He also does not speak English. These facts did not deter Donovan, who determinedly scoured the Internet for coverage of Suekichi's work, finally locating an editor, Natsuki Yamada, who agreed to contact the reclusive artist and interpret for him. The other artists were not much easier to find: they hail from all over the globe, and speak many languages besides Donovan's own. In these cases, Donovan reached out using Google Translator to convert his emails to into their native language. The artists, including Donovan himself, whose work has been brought together for the first time in Oxford are what is known as “Steampunk Makers.” Makers, inventors as much as they are artists and artisans, create objects that, like Suekichi's watches, are wonders of imaginative, magical absurdity. 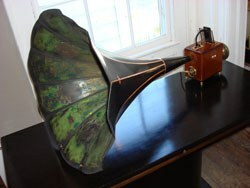 The exhibition includes, among other things, a phonograph with ipod dock, a space helmet with top hat and goggles, motors powered by tealights, a mechanical arm, a pachyderm-shaped gas mask with amplifier ears, and a model of a gothic cathedral with caterpillar treads and a gun projecting through its front doors. Their common aesthetic has been called “Baroque retro-tech” and brings to mind a world with sky-pirates battling in dirigibles, clunky robots, cloak-and-dagger mysteries, and the hissing, clattering machines of an era before the silencing invention of electricity. When he first happened upon an image of a steampunk laptop while Googling new trends in art and design, “It blew my mind,” Donovan says, “it looked like something from the 19th century.” Donovan didn't want to keep it to himself. “I wanted to have a physical venue where people could see these artworks in person,” he says, “I wanted them to be as excited as I was.” Previous to the Oxford exhibition, the only place one could see such works was online. We are a technological society. When we trifle, in our sly, Gothic, grave-robbing fashion, with archaic and eclipsed technologies, we are secretly preparing ourselves for the death of our own tech. Steampunk is popular now because people are unconsciously realizing that the way that we live has already died. We are sleepwalking. We are ruled by rapacious, dogmatic, heavily-armed fossil-moguls who rob us and force us to live like corpses. Steampunk is a pretty way of coping with this truth. 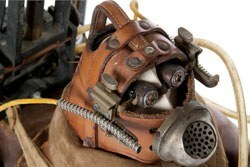 Perhaps this realization is more widespread than is often recognized: the steampunk aesthetic crops up throughout pop culture, from film (think of Howl's Moving Castle, 9, or The Golden Compass), to fashion, comics, computer games (the game Machinarium for example), and events like Burning Man.